"Looking for the best family home in town?? This is it! 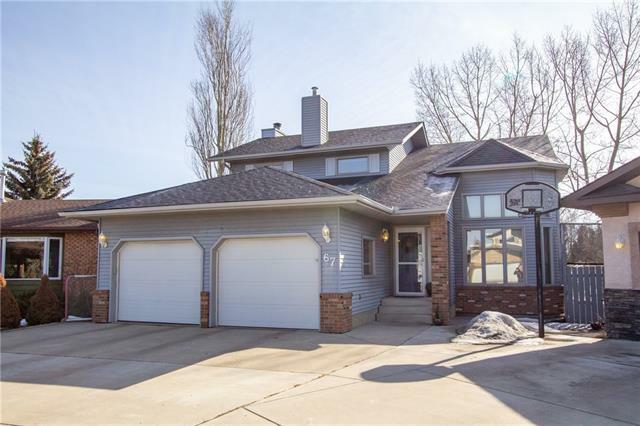 Located on a quiet cul de sac this 2 storey home features 2767 sq ft of development! Walk into a spacious entry with cathedral ceilings and open plant shelves. The living / kitchen area features newer hardwood while the rest of the home features newer carpet! There is a beautiful oak kitchen with newer stainless steel appliances. There is an eating area and a separate large dining area. The garden door off of the kitchen leads to a 2 tier raised deck with a hottub! There is a rear family room and access to a 2 pc bathroom and garage access. The upper level features 3 bedrooms. The master bedroom features an upgraded ensuite with a steam shower, heated floor and walk in closet. There are 2 more spacious bedrooms and a full bathroom. There is even a laundry shute to the basement level. The basement is fully finished with a spacious laundry room, cold room, bedroom and family room and a 3 pc bathroom. This home also features a WALKOUT"